I must admit – flourless cake is not a favorite dessert of mine. It doesn’t even crack the top 25. I have never once ordered it in a restaurant, never picked it out of a bakery’s glass case, and never requested it as a special treat. What can I say? I am a carb lover, through and through. If I am going to have cake, you can bet there’s going to be flour in there. Ice cream, on the other hand, I could happily eat every day. I love my ice cream maker, but it has been sitting up on the shelf for so long that I was afraid it was starting to grow roots up there. I was glad to have an excuse to blow the dust off of it and put it to use. Not use any refined sugars. You read that right. No refined sugars. Several months ago I discussed my desire to cut back on refined sugars, but then the holidays came and I reverted back to viewing sugar as a food group all of its own. When Ash Wednesday rolled around this year, I decided to give up refined sugar for Lent. Of course, I left this DB challenge to the very last day (today) which means that it now falls under the “no refined sugar” rule. I was happy that it was cake paired with ice cream rather than one that relied on frosting or something else entirely sugar dependent. I’m happy to report that the recipes came out quite well, though I would definitely tweak them if I were to make them again. The cake turned out chewy and very, very chocolately. Incredibly chocolately – a little too chocolately for my liking, but it would be a true chocoholic’s dream come true. The ice cream had great consistency and a yummy coconut flavor, but it would have benefited from a wee bit more sweetness. 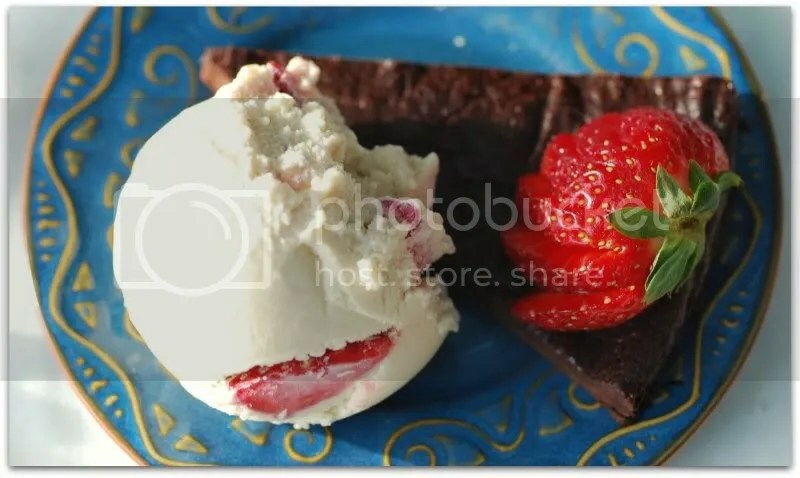 I would recommend adding some agave to the ice cream to make it just that much better of a companion for the rich chocolate cake. Of course, that could be my jonesin’ sweet tooth talking. 1. Puree tofu, coconut milk, brown rice syrup, and vanilla in a food processor or blender until smooth. 2. Pour into ice cream maker and mix per manufacturer’s instructions (for my Cuisinart ice cream make I mix it for 30 minutes). 3. 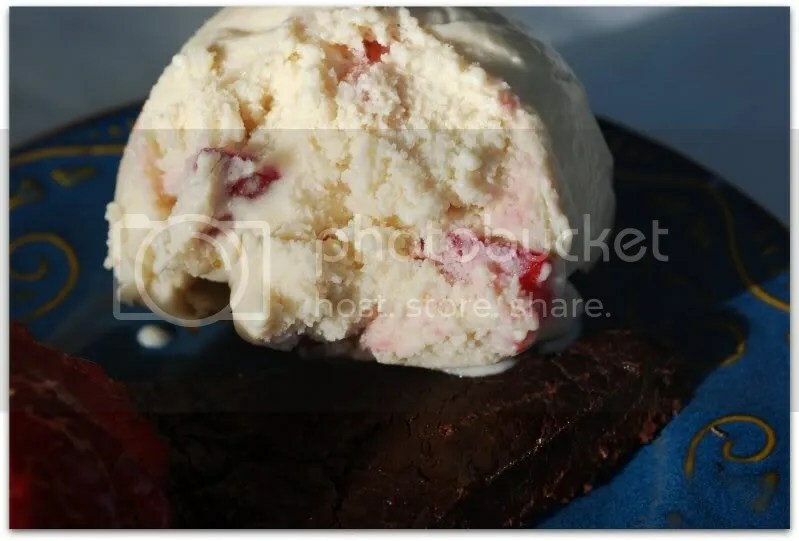 Pour ice cream into freezer safe bowl, stir in strawberries, and freeze for at least 4 hours before servings. 1. Preheat oven to 350F and grease a springform pan. 2. Melt chocolate and soy butter in a double boiler over low heat until smooth. 3. While the chocolate is melting, stir the arrowroot into the soy milk and whisk with a fork until completely dissolves. Pour the soy milk mixture into a mix bowl, add the yogurt and vanilla and mix until well combined. Add the cocoa powder and mix until smooth. Pour in the chocolate mixture and mix on medium high for 2 minutes. 4. Pour batter into the prepared pan and bake for 35 minutes. Cool on a wire rack for 20 minutes before unmolding. Refrigerate for at least 1 hour before serving. The look so beautiful! I actually gave up baking for lent – but knew I was going to make a raw one before making *that* decision. Good luck with the sugar-fast. It’s so evil, but so banal – it’s great that you’re kicking it! Looks good! I’ll have to try that ice cream recipe when it warms up over here. I love your creative cake recipe substitutions. It looks like it turned out quite well. That ice cream is screaming for me! just look at that ice cream! Thank you for posting both recipes! I’ll make the ice cream as soon as it gets warmer. 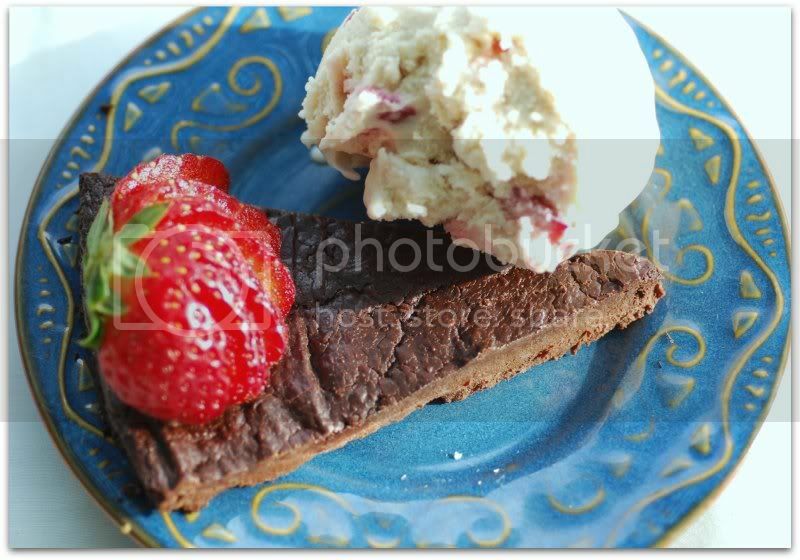 Strawberry and coconut us such a great flavour combination! I love the idea of coconut ice cream with this cake, kind of like a grown up Bounty Bar idea 🙂 Yum!!! Your alternative recipes sound so good. I’m trying to cut back on refined sugar too, so I’m going to definitely try your versions of the ice cream and cake. Wonderful job! Wow. That looks awesome. I really loved your seitan pot roast that you did a while back. Do you live in Hawaii? Great job handling those substitutions! is the silken tofu supposed to be firm or soft?